It was a shock a few hours ago to come here to my somewhat-neglected blog and find that it’s been a bit over two months since I last wrote. Oy. I knew it was a while, but had no idea how long a while. Back in the saddle now, laying track for the year to come — even as I look back over the year just past. A bit of auld lang syne, for me and for you. Finally, please say hello to my new tool — a beautiful hand-rubbed cherry 8-shaft traditional loom. I’ve begun weaving the first scarf series on it, called “Kilauea”. 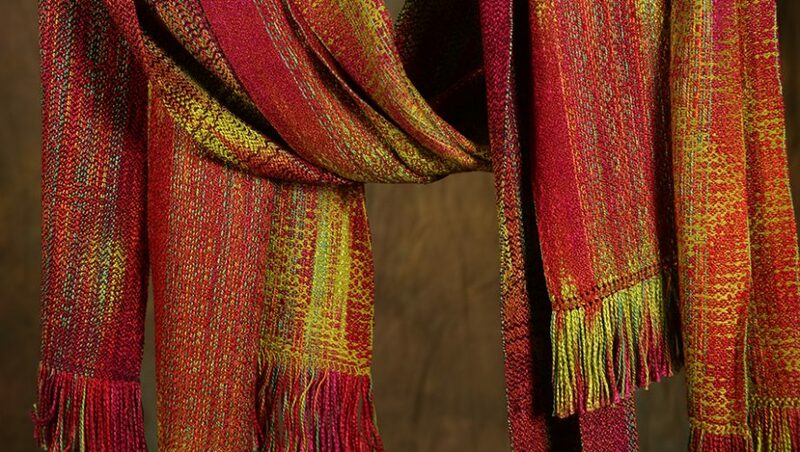 With two looms to work on, each of them requiring very different body mechanics and closeness of attention, my life as a weaver is on the cusp of becoming both more pleasurable and more challenging. And a reminder of the other focus of my daily life this year — the garden. I’ll leave you with a few reminders of the seasons we’re all now remembering with fondness and anticipating with impatience. It’s been a good, satisfying year in almost every respect. My plans for the year ahead are nearly crystallized. I’m looking forward to the sense of both a continuation and a fresh start, balancing this evening on the conjunction of the two. My warm wishes to you for an interesting, challenging, and heartening 2016. Thanks for this glorious recap! A wonderful look back at 2015. Congrats on your new play “thang” (that loom if you did not get my meaning, lol)…..